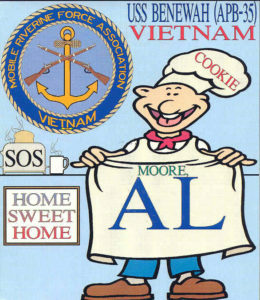 Watch this page for scrumptious recipes guaranteed to temp your taste buds (or make you think you are in the Navy again). 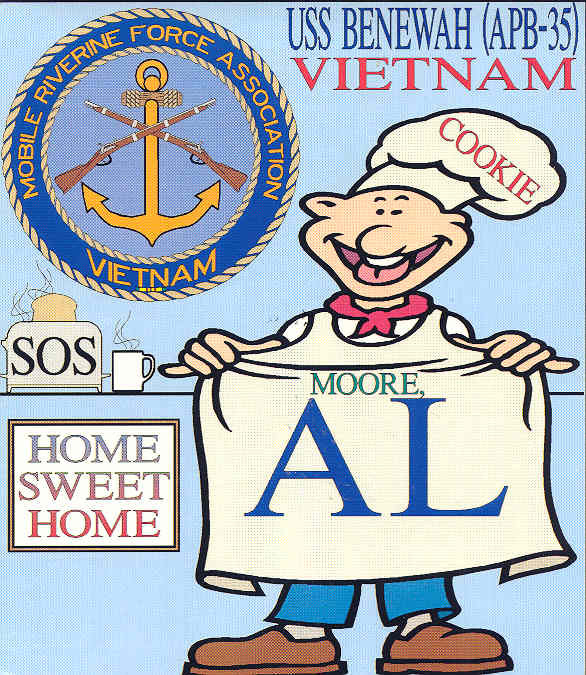 Thanks to Albert “Cookie Man” Moore (mrfa35@outlook.com) for these great recipes!! 2. Pour the melted margarine into the bottom of a 9x13 inch baking dish; set aside. 3. In a medium bowl, combine the flour, baking powder and white sugar. 4. Stir in 1 cup of the reserved liquid from the peaches and the milk until smooth. 5. Pour the batter evenly into the bottom of the dish over the margarine. Do not stir. 6. Spoon peaches over the batter. 7. Bake for 35 to 40 minutes in the preheated oven, or until the top is golden. 2. Grease a 2 quart baking dish. 3. In a medium bowl, mix together applesauce, 1/2 cup brown sugar, 2 teaspoons cinnamon, and salt. 4. Place sliced apples in a large bowl. Add applesauce mixture and stir well. Spoon mixture into baking dish. 5. In a small bowl, mix together 1/2 cup brown sugar, 1/2 teaspoon cinnamon, and flour. Stir in melted butter or margarine. Sprinkle mixture evenly over apple filling. 6. Bake in preheated oven for 1 hour. 1. Preheat an outdoor grill for medium-high heat. 2. Score one side of the flank steak with diagonal cuts. 3. Season meat on both sides with tenderizer, pepper, garlic powder, and salt; lay flat, scored side down. 4. Sprinkle with parsley, and lay bacon strips lengthwise on steak, then roll up jellyroll style. 5. Skewer with 8 evenly spaced wooden toothpicks. Form 8 steaks by cutting in between toothpicks with a serrated knife. 6. Place steaks on preheated grill. Cook for about 15 minutes, turning once, or to desired doneness. 1. Heat oil in a large skillet over medium-high heat. Add the carrots, celery, onion, and garlic; cook and stir for a few minutes, until the onion is transparent. Add the sausage to the skillet, and cook for a few more minutes to brown. 2. Pour in the kidney beans, cannellini beans and tomatoes, and season with the bay leaves, thyme, salt and pepper. Cover, and reduce the heat to low. Simmer for 10 minutes, stirring occasionally until vegetables are tender. 3. Remove bay leaves and discard. Sprinkle parsley over the top, and serve. 1. Brown beef in skillet, stirring until done. Drain grease. 3. Layer beans, cooked beef, cooked potatoes and onions in a 2 ½ -quart casserole. Sprinkle with salt. Mix tomato soup with water and pour over all. Top with green pepper. Cover tightly and bake for 1 hour in a preheated 350° oven. For perfect meal, serve with cole slaw and cornbread. 1. Take meat and chop into 3/8-inch cubes, removing all gristle and visible fat. Brown in an iron skillet, about 2 pounds at a time. 2. Place in a large cast-iron chili pot, adding tomato sauce and equal amounts of water. Add chopped onion, garlic, jalapeno peppers (wrapped in cheesecloth) and chili powder. 3. Simmer for 20 minutes, then add the cumin, oregano, salt and cayenne pepper to taste. 4. As moisture is required, add homemade beef stock until amount is used, then add water if needed. 5. Simmer, covered, until meat is tender (about 2 hours), stirring occasionally. 6. Then add the Masa Harina to thicken if needed. Add paprika for color. Cook 10 additional minutes; correct the seasoning. Discard the jalapenos and serve. 7. A small additional amount of cumin enhances aroma when added in the last ten minutes. 1. Brown the meat, then drain. 2. Add oleo. Stir in the onions and cook until you can see through them. 3. Add flour, stir and cook two to three minutes. 4. Add garlic, soy sauce, Worcestershire sauce and mix thoroughly. 5. Add milk and stir until it thickens. Serve over bread. 2. Add beef stock powder, flour, salt, pepper and then cook. 4. Add milk and stir over low heat until thickened. 5. Serve on burnt toast. Burgers are cooked with cheese and topped with green chile peppers, tomatoes, and onion. 1. Mix lean ground beef with garlic, pepper, ground chile, and salt in a large bowl. 2. Shape into 4 flat patties. 3. Preheat broiler or grill, then cook burgers about 4 inches from heat, turning when halfway done. 4. Cook until very little or no pink remains. 5. Just before serving, place a slice of cheese or grated cheese on each burger. 6. Top each bun with a hamburger patty and cheese, green chile peppers, an onion slice, tomato slice, and lettuce leaf. 7. Serve burgers with a dish of salsa on the side. 1. Heat oven to 400'F. 2. In bowl, beat together SPAM, eggs, and milk. 3. Melt butter in large skillet; add egg mixture. 4. Cook, stirring, to desired doneness. 5. Fill each tortilla with SPAM mixture and half of cheeses. 6. Roll burrito; place seam side down on 12x8" baking dish. 7. Sprinkle remaining cheese over top of burritos. 8. Bake 5-10 minutes of until cheese is melted. 1. Using a blender or whisk, combine dressing/marinade ingredients till well blended. 2. Pour about 2/3 of the mixture over the chicken and Marinade for 30 min-1 hour. 3. When ready to cook season chicken with salt, pepper and paprika. 4. Either grill or broil chicken breasts till just done. 5. As chicken is cooking sauté mushrooms in the 2 tbs of butter. If grilling chicken place chicken once done on a broiler pan or Cookie sheet. On top of the chicken place 2 slices of bacon, 1/4 of the mushrooms followed by 1/4 c. each of the Monterey Jack Cheese and Cheddar Cheese. Bake at 375° till cheese is melted. Sprinkle with parsley. Serve with remaining dressing mixture. 1. Cook sweet potatoes until tender. Remove skins and mash. 2. When smooth, beat in butter, milk, salt, spices. Beat well. 3. Fold in walnuts and turn into buttered baking dish. 1. PREHEAT oven to 350º F. Grease 9-inch-square baking pan. 2. MICROWAVE dried cherries and merlot wine in small, uncovered, microwave-safe bowl on HIGH (100%) power for 1 minute. Set aside for 15 minutes, stirring occasionally. Drain cherries; discard wine. 3. MICROWAVE chocolate in small, uncovered, microwave-safe bowl on HIGH (100%) power for 1 minute; STIR. Sections may retain some of their original shape. If necessary, microwave at additional 10- to 15-second intervals, stirring just until smooth; cool to room temperature. 4. COMBINE flour and salt in small bowl. Beat sugar and butter in medium mixer bowl until well mixed. Add eggs and beat until light and fluffy. Beat in melted chocolate and vanilla extract. Stir in flour mixture until blended. Stir in drained cherries. Spread into prepared pan. BAKE for 33 to 37 minutes or until wooden pick inserted in center comes out slightly sticky. Cool completely in pan on wire rack. Cut into bars. NOTE: Sweetened dried cranberries can be substituted for the dried cherries. 1. MIX all ingredients for Potato Crust in a bowl and set aside. 2. MIX 1 ½ cups flour, salt, pepper and Italian seasoning in a shallow dish. Dredge chicken in the mixture, shaking off any excess. Heat 3 Tbsp oil in a large skillet. Cook chicken breasts 2 at a time over medium-high heat until golden brown and crisp, or until internal temperature reaches 165° F. Add more oil for each batch as necessary. 3. PLACE cooked chicken breasts on a baking sheet or dish and top with potato crust mixture. Transfer baking sheet to a pre-heated broiler until golden brown (1-2 minutes). 4. COOK pasta according to package directions. Drain and set aside. 5. HEAT 2 Tbsp oil in a sauce pan. Add roasted garlic, cook for 1 minute. Stir in 1 Tbsp of flour and wine and bring to a boil. Add cream, parmesan cheese, 1 Tbsp parsley, and tomatoes. Sauce is done when it is bubbling throughout and begins to thicken. 2. Melt butter and combine with the Graham Cracker crumbs and sugar. 3. Press into bottom of a 1 quart casserole dish. Top evenly with chocolate chips. 4. Bake for 5 minutes until chocolate is melted. Spread melted chips out evenly over crust. 2. Add milk, oil and vanilla and stir until smooth. Stir in chocolate chips, coconut, and nuts. Pour into crust. 3. Bake, uncovered, for 35 to 40 minutes, until a wooden pick comes out clean. 4. Serve warm with ice cream, hot fudge and caramel sauce. 1. In a medium saucepan stir together sugar, water, salt, and cornstarch. 3. Continue to cook and stir for about 1 minute or until thick and glossy. 4. Remove from heat and stir in jello and strawberry extract. 5. Let cool to room temperature. 6. Place 1/2 the whole strawberries over bottom of baked pie shell. 7. Place 1/2 the filling mixture over strawberries. 8. Use remaining strawberries in pie and cover with remaining filling. 9. Chill in refrigerator for 2 or 3 hours before serving. 10. Serve with whipped cream. This makes one 9 inch pie.